Home / Clinical Architecture Healthcare IT Blog / Healthcare Interoperability: Are We There Yet? I recently had my car serviced, and although I took it to my local dealer’s service center, it was not the same location where I purchased the car. When I was asked to fill out a form to provide details about myself and the vehicle, I asked if they could pull the information from the place where I bought the car. The attendant said that they could only retrieve data related to nationwide recalls, and all other information would need to be manually entered into their system. This reminded me of interoperability challenges we face with our healthcare data, many of which are summarized in the HIMSS Interoperability Call to Action. Therefore, I thought it would be worthwhile to review some recent developments in our industry, and at Clinical Architecture, that may drive (pun intended) our nation closer to being able to exchange the right health information for the right patient and the right parties, for the use cases that matter most. The Office of the National Coordinator for Health Information Technology (ONC) defines interoperability in its Interoperability Roadmap as “the ability of a system to exchange electronic health information with and use electronic health information from other systems without special effort on the part of the user.” With the development of standards, we’ve made progress with certain interoperability use cases (e.g., secure messaging with Direct addresses; exchange of unstructured narrative information using the C-CDA standard), but there is still room for improvement related to exchange and use of both unstructured and structured patient data. The following framework describes a variety of criteria, each of which must be satisfied in order for two parties to send, receive, and use health information without special effort on the part of the user. Source: Seven Deadly Sins of Healthcare Analytics and How to Avoid Them. Webinar hosted by Clinical Architecture, February 13, 2018. 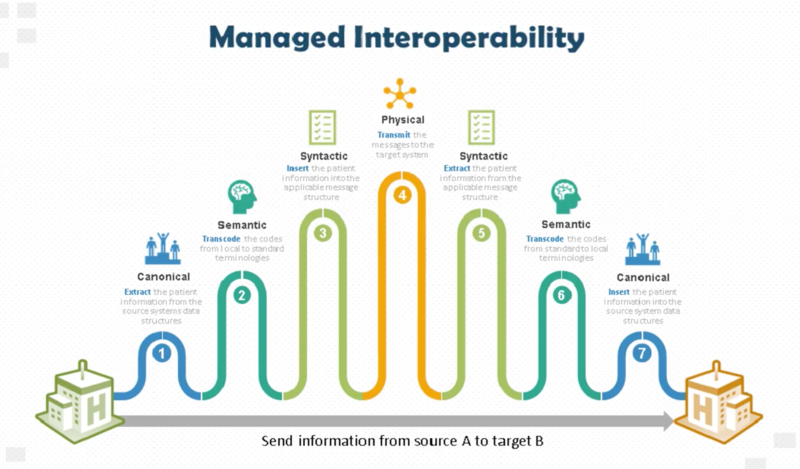 Clinical Architecture has pledged to support national interoperability standards, policies, guidance, and practices for the exchange of electronic health information. To illustrate, our Symedical application supports the acquisition and usage of standard terminologies like ICD-10, SNOMED CT, LOINC, RxNorm, and all the clinical categories discussed in the Desiderata for the Data Content of the Next Generation EHR. Our Advanced Clinical Awareness suite of inferences are built on standard terminologies, and structured patient data can be sent via CCD, FHIR, and HL7 v2 messages, while API transactions can be mediated using CDS Hooks or SMART on FHIR as described in a NEJM publication entitled, “A 21st Century Health IT System—Creating a Real-World Information Economy”. Our text analytics solution (SIFT) finds clinical concepts in unstructured text and proposes codified concepts using the appropriate standard reference terms. Finally, we recently introduced Symedical on FHIR™ which is based on the HL7® FHIR® Terminology Service specification and provides runtime access to terminology assets such as code systems, value sets, and concept maps. Clinical Architecture also recently joined CommonWell Health Alliance, a network that provides a variety of interoperability services such as person enrollment, record location, patient identification and linking, and data query and retrieval. Inherent to our participation is a goal to help improve data quality so that the information being exchanged through such services is normalized, clean, and usable. Source: Draft U.S. Core Data for Interoperability (USCDI) and Proposed Expansion Process. These data classes can be supported by commonly used standards such as C-CDA and FHIR. USCDI also defines an expansion process whereby candidate and emerging data classes under consideration may be appended to USCDI over time. Source: A User’s Guide to Understanding the Draft Trusted Exchange Framework. Through TEFCA, qualified health information networks and their participants will be required to support all of the USCDI data classes. Similar to CommonWell, participation in TEFCA will be optional. However, the existence of interoperability frameworks and networks lays the foundation for further progress with healthcare interoperability use cases. In a patient-centered approach to interoperability, CMS announced the MyHealthEData Initiative on March 6, 2018. Its aim is to help patients gain electronic access to their health information using the device or application of their choice, as well as share their data with whomever they want. Part of the approach to achieve this goal involves the release of Medicare’s Blue Button 2.0 which is an API that enables Medicare beneficiaries to access their claims data which contains information about their Medicare coverage, drug prescriptions, primary care treatment, and cost. If successful, this could help position patients at the center of the healthcare system and empower them to make more informed healthcare decisions. I hope this summary of recent interoperability efforts has been informative. It feels like our industry has been on a long road trip to interoperability, so one might ask, “Are we there yet?” A common response is that we’ll know we’ve arrived when we stop asking the question. In other words, the destination may be somewhat uncertain, and the estimated time to arrival may also depend on the use case. That being said, let’s continue to make the most of the journey by combining our most innovative and promising technologies with the outcomes-oriented business processes that will give us the greatest returns on our healthcare expenditures. We hope to see you along the way.